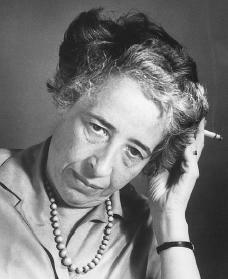 Throughout the war years Arendt wrote a political column for the Jewish weekly Aufbau, and began publishing articles in leading Jewish journals. As her circle of friends expanded to include leading American intellectuals, her writings found a wider audience. Her first major book, The Origins of Totalitarianism (1951), argued that modern totalitarianism (government with total political power without competition) was a new and distinct form of government that used terror to control the mass society. “Origins” was the first major effort to analyze the historical conditions that had given rise to Germany’s Adolph Hitler (1889–1945) and Russia’s Joseph Stalin (1879–1953), and was widely studied in the 1950s. The Human Condition established Arendt’s academic reputation and led to a visiting appointment at Princeton University—the first time a woman was a full-time professor there. On Revolution (1963), a volume of her Princeton lectures, expressed her enthusiasm at becoming an American citizen by exploring the historical background and requirements of political freedom. 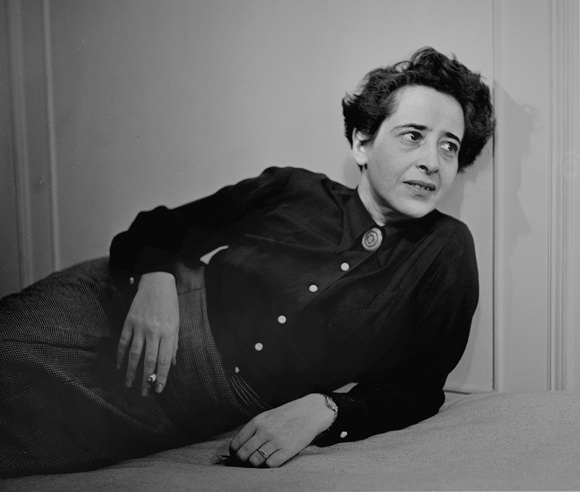 Hannah Arendt by Fred Stein, 1944. At the University of Chicago (1963–1967) and the New School for Social Research in New York City (1967–1975), Arendt’s brilliant lectures inspired countless students in social thought, philosophy, religious studies, and history. Frequently uneasy in public, she was an energetic conversationalist in smaller gatherings. Even among friends, though, she would sometimes excuse herself and become totally absorbed in some new line of thought that had occurred to her. During the late 1960s Arendt devoted herself to a variety of projects: essays on current political issues, such as civil unrest and war, published as Crises of the Republic (1972); portraits of men and women who offered some explanation on the dark times of the twentieth century, which became Men in Dark Times (1968); and a two-volume English edition of Karl Jaspers’s The Great Philosophers (1962 and 1966).